Are You A Resolution Champ? We’re already a few days into this, are you ready to make it stick for good? 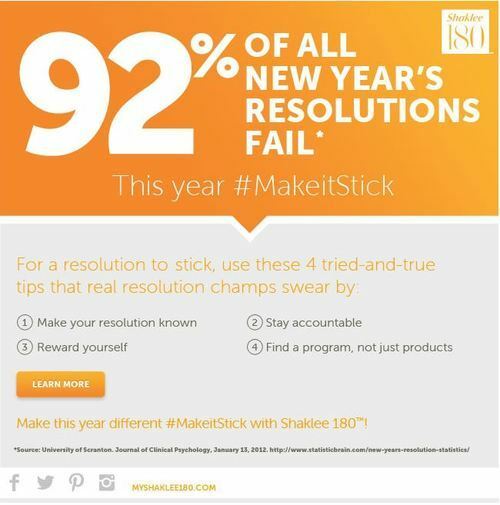 Click here for some great ways Shaklee is supporting you in your efforts to be in that 8% of people who make their New Year’s Resolutions stick. When you’re ready to get your Shaklee 180 lifestyle program started, go here for everything you need. You can even get up to $100 in free products AND free shipping for a year! And check out these 3 resolutions that won’t cost you a thing, but will make such a difference in how you feel about yourself and about 2014 too. “New Year’s resolutions don’t have to fail — that is, if they’re realistic in the first place. I have three New Year’s resolutions that are not difficult to achieve and have the potential to enrich your life beyond measure. Simplify We humans are great at complicating things. We can take almost any concept and make it harder than it has to be. Maybe it’s my age, or maybe it’s the fact that I’m a survivor of multiple sclerosis (MS) and triple-negative breast cancer (TNBC), but I’ve learned a lot about simplicity. Simplicity means decluttering your space and your spirit. Strive for less “stuff,” those things that take up personal space and energy. It doesn’t have to be a big project. All you need to do is simplify things as you encounter them. Can’t find the scissors in the kitchen drawer? Rather than wait until you have time to reorganize the entire kitchen, clean that drawer right now. Get rid of anything that isn’t essential. Donate it or give it to someone who can use it. When the impulse to buy hits, give yourself a few days to consider if you really need it. Bonus: less stuff makes cleaning that much easier. In time, streamlining becomes second nature. Play! What’s life without a little playtime? If you’re waiting for all the chores to get done before you play, it’s never going to happen. Make playtime part of your routine. Whether you choose to run around outside with the kids or sit down for a board game, the important thing is that you’re doing it for the fun of it. Start that hobby you always wanted to try. Take the trip you were saving for “some day.” Use the good dishes, even when it’s not a holiday. What are you waiting for? That someday won’t actually happen unless you make it happen. Add a Little Kindness Having a truly rotten day? You can probably find someone who’s having a worse day. Performing a simple act of kindness can lift your spirits in a big way. It can be as simple as calling an old friend you haven’t spoken to in years, or chatting with the neighbors you usually pass by so hurriedly. There are lots of simple kindnesses that don’t cost a dime. Hold the door or elevator for someone even though you’re in a hurry. Thank someone for the work they do even though it’s their job — the package delivery person, the nurse, your food server, etc. Donate clothing and household items that you no longer need or want. Volunteer at the local charity of your choice. Give up your seat to someone who looks like they need it more than you do. Pick up the discarded food wrapper on the sidewalk rather than pass it by. You get the idea. It’s the common courtesies, the little niceties, so easily overlooked in our busy world, that mean so much. The thing is, sometimes, you’ll be the only one who knows of your kindness. Sometimes, the recipient won’t appreciate your kindness. Either way, that’s okay, too. It is no reflection on you, and you can still feel good for having tried. It always makes my day when I’m the recipient of a kindness and it inspires me to keep it going. Kindness is contagious. Live Gratefully Even in trying times, there is much for which we should be grateful, but it’s sometimes difficult to see what’s right in front of our eyes. Find at least one thing to be grateful for each day. It doesn’t have to be a splendiferous thing. In fact, it can be most ordinary. When you take the time to think about it, those little, ordinary things have a lot to do with our mood. For instance, at this particular moment, I’m grateful for the bird singing just outside my front door. I hear it on most days and I miss it when I don’t. To acknowledge that is a good thing. Simplicity, kindness, and gratefulness. That’s the gist of my New Year’s resolutions.